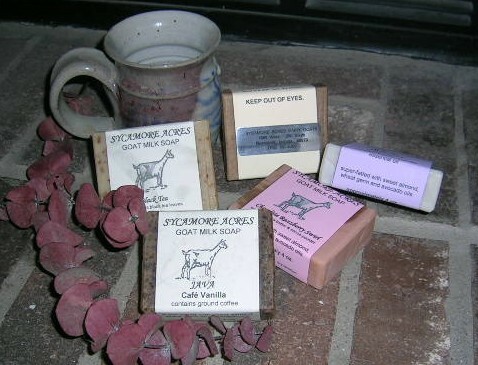 Below you will find a variety of items, all meticulously hand-made, all about goats! Postage is additional. Indiana residents please add 7% sales tax. Our cold-process soaps are handcrafted using only vegetable oils. All contain soybean, coconut, palm and palm kernel oils and are superfatted with avocado, olive, and jojoba oils. Some also contain cocoa butter. 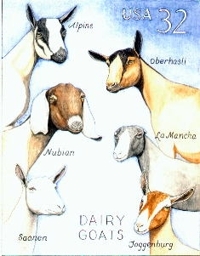 Each bar contains approximately 1 oz of Alpine goat milk. All bars are approximately 4 oz and are $4 each unless otherwise stated. A classic scent that is known for its ability to help one relax. Scented with essential oil. Garden and Kitchen - For help in removing tough odors (like buck - we've been told it even removes pig scent!) and dirt from hands. Contains ground coffee. While it was developed as a hand soap, some customers use it in the bath to help smooth rough skin on their feet and heels. This soap has the warm scent of "sweet spices" - cinnamon, cloves, ginger and nutmeg. Contains ground cinnamon, cloves, nutmeg and ginger as well as the essential oils of cinnamon and clove. The ground spices impart an attractive speckled appearance. A combination of the deep, earthy fragrance of patchouli with the fresh, invigorating scent of peppermint. Ground nutmeg gives it a speckled appearance. Fresh scent of cucumbers and cantaloupe. Contains barley juice powder for a very subtle green color. The exotic scent of black tea is one that both men and women will enjoy. Contains black tea leaves. Cold-process soap improves with age. Unfortunately, there is a drawback to using essential oils (as opposed to synthetic fragrance oils) in that the scent fades with time. Occasionally we have available wonderfully mellow but subtly-scented soaps for the reduced price of $2/bar. We also may have irregularly-shaped bars and discontinued scents for $2/bar. Please e-mail for availability. 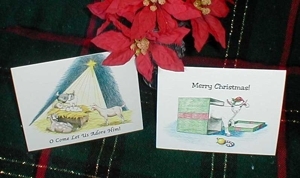 E-mail sycamoreacresalpines@gmail.com with your order and mailing address. I will get back to you with your order total (including postage and tax if applicable). would like your package insured. If you have a PayPal account you may pay using PayPal, however, the fee we are charged will be added to your total. 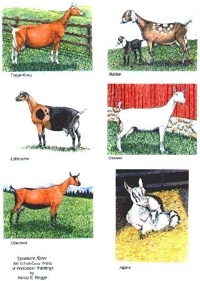 Our account is milkgoats@aol.com. Your order will be sent when your payment is received. Thank you!